The thought of a student asking me this question in a classroom, where I would have to improvise a coherent answer, is enough to make me retire. Story arc?! A short story of mine was recently rejected by an esteemed literary journal, which I’ll call…Chipped Vase Quarterly. In their rejection, the editors of Chipped Vase Quarterly said that although they weren’t accepting my story, they encouraged me to submit more work in the future. This was an emailed rejection, and I’ve received similar ones from other journals. My question is whether this counts as a personalized rejection, or if it’s just a form letter. If it’s just a form letter, is it a more positive form letter than others at the journal’s disposal? Are there tiers of rejections? I’m not sure why it matters — a no is a no is a no — but, still, it matters. My other question is, if it is a form rejection, whether I should pay attention to its content. Do they really want me to submit something else? Your guidance is appreciated. Oh you poor soul. It seems like only yesterday I was in your position, reading rejection letters as if they were tea leaves, trying to discern some deeper meaning. (Er…probably because it was yesterday.) The rejections that arrive in the mail are often no bigger than toilet paper squares, and just as mute, and the ones that come hurtling into your inbox feel even more impersonal. The whole submission process takes forever and it can be so disheartening to get a no. It shouldn’t also be mysterious! What’s a poor writer to do? The rejection you described does not sound personalized. Now, don’t be crestfallen; it’s helpful to remember that the devoted people who read for and edit literary magazines are often overworked and underpaid — if paid at all — and that we should not blame them for using form rejections, nor for taking a long time to consider our work. That said, I believe that anything encouraging in a rejection should be taken seriously, form letter or not. Tenacity is the key to being published. (So is revising. And: submitting to magazines whose aesthetics align with your own. Duh.) When someone asks you submit again, do so. If a magazine didn’t want you to submit again, then why mention it? I don’t know about other magazines, but we do have tiers of rejections. For the slush pile we have two form rejections: One reads “Thank you for submitting your work…We regret that we are unable to publish it.” The other includes the line “we like your work and would like to see more of it.” Work that is submitted directly to me usually receives a personal reply, by hand or by e-mail, depending. And then there are those cases when a submission gets lost on my computer, or underneath somebody’s desk and the months go by…but we are trying to eliminate that tier. PANK has three tiers of rejection. Our form rejection simply says thank you but your work wasn’t right for PANK; we also ask writers to wait thirty days before resubmitting. We have a second rejection where we enjoyed the writer’s work but encourage them to resubmit after thirty days has passed. Our most personal rejection, often accompanied by a note from an editor, is for the work we love and hate to say no to, and we encourage these writers to resubmit anytime. The quality of the work dictates which rejection a writer will receive. The Missouri Review uses a submission management program called Submission Manager. Several other magazines use it, too — Ploughshares, for one — and most writers are certainly familiar with the system. It’s easy to upload the manuscript and the writer receives an automated “Thank you for submitting your work” email from us. Email is how we contact the writer, regardless of our decision. Over the course of a year, we receive approximately ten thousand submissions, and of those, we publish about forty or fifty manuscripts per year. SubMgr allows the editorial staff to create different types of rejection emails. We do have what we call a “form rejection.” In the last five months, about thirty percent of our rejections receive our form rejection. Any litmag editor will say the same thing: we would like to be able to give a personal response to every writer, but the sheer volume of work we receive makes this impractical, if not impossible. We do receive plenty of submissions that are wholly inappropriate for our magazine and/or poorly written, but we never tell the writer to take a long walk off a short pier and hug an octopus. After all, no matter what we think on our end, chances are that the writer, regardless of his or her ability, spent weeks on the story. Our entire editorial staff is made up of writers: we know how tough this process is and we would never insult a writer in such a manner. All other rejections can be considered “personal,” though we do have templates that plugin some basic information, such as the writer’s name and the title of the work that was submitted. We encouraged our interns and editors to provide encouragement, not criticism, about the manuscript. Something such as “we really enjoyed the energy and detail of the penultimate scene between Paul and Joanne.” It’s important for our writers to know which pages worked best for us. This, of course, might not be true of any other magazine (another editor may love the opening scene more) but it gives the writer a good sense of what fits TMR for any future submissions. We always encourage the writer to submit again. We have no idea who the writer is, and we’ve published many authors who have been trying to get into our pages for years. So we always want to let writers know that we would like a chance to read their future work. The Rattling Wall e-mails out three types of rejections. First, and most common, the basic “no thanks” rejection. Second, if the reading staff and I really enjoyed a writer’s voice, but the piece they submitted isn’t right for the issue we’re making, I’ll e-mail the writer and encourage them to submit again. Third, I will (rarely) e-mail a writer and ask them to “hold” a submission that I love for a future issue of The Rattling Wall. The few times I’ve done this, I’ve always told the writer they can “pull” their piece any time during the hold, as I realize it’s a lot to ask of someone who is eagerly submitting. At Slush Pile, there is usually only me and I personally read through every submission. What I would love for writers to understand about the reading process is: that first paragraph — that first sentence — is invaluable, because if it fails, there is no reason for me to carry on reading the submission. There is a standard reject that goes out, generally to writers who have submitted too early (as in, they haven’t properly polished their story or they just haven’t spent enough time honing their prose) or to people who are just writing in a style that is wrong for the magazine. Since Slush Pile lays a pretty heavy premium on literary prose, this is often experimental fiction or stories that are written with attention to plot over prose. If a person is writing in a style that is suitable for the mag, but the story itself does not appeal to me in subject matter or because, perhaps, their writing is not quite on the level, but I feel like it might be soon, they get a kind rejection. I will also generally send a personal note to anyone whose cover letter makes it obvious that they have spent time reading the magazine. Most submissions are sent out blindly, like spam, so it’s always nice when someone is actually submitting because they enjoy the mag. At Harvard Review, things are a bit more complicated. There are sometimes as many as ten readers on the first tier (but often fewer). A story goes to at least two of them before it is rejected and, if it is recommended twice, it makes its way on over to me. I have a look at it, and if I like it, I pass it along to Laura and Christina (managing editor and editor, respectively). The number of submissions we receive at Harvard Review are wild, so that limits our ability to send more personal rejection letters (although, sometimes we do) and significantly hinders our ability to respond in a timely manner. Sometimes people are waiting upwards of a year before they hear a final decision from us, but we do read all of the submissions. Christina says she tells people to send along their submission and then try to forget about it. I tell people by way of encouragement — and this is honest — that the longer it takes us to respond, the better the submission did. If you have to wait eight or ten months before you hear back and then receive a standard rejection, that’s got to be completely disheartening. But maybe it softens the blow to know that four or five people liked it, first. The specifics for us are basically just that we have two different rejection templates within Submittable — the basic no, and the little bit (though admittedly not much) more nice/encouraging one. I’ll also say, how these two get doled out is pretty subjective and all over the place. We have a team of editors, though we generally take turns instead of conferring. For the website, the three fiction editors/two poetry editors take month-long turns and they get total autonomy during their turn. So, you know, one might just always use basic No, not wanting to worry about distinctions; another, nicer editor might practically always use the nicer no; and everything in between. McSweeney’s has definitely had varying tiers of responses over the years, depending on how we were sorting through submissions and who was doing the rejecting. We’ve asked writers whose work we liked to include code words on the envelopes or subject lines of their ensuing submissions, to ensure we’d pull them out of the pile; we’ve had readers add personal responses to our reply cards, in some cases; and we’ve employed various other proprietary tweaks, too. When we come across someone we want to hear more from, we’ll try to make that clear, for sure. As you can see, I was correct in assuming that a rejection that asks you to submit again should be taken seriously. (See? I am always right!) Also, it’s clear to me from these answers that the submission/acceptance process isn’t scientific. Literary magazines are created by real, living people, and real, living people are particular and idiosyncratic. We cannot fault them for loving what they love, which means we also can’t fault them for not loving what they don’t love. In the end, they’re just looking for a terrific short story…whatever that means to them. So get off the internet and write one, why don’t you? 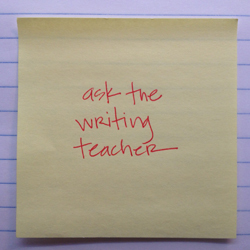 Here’s a suggestion: Write your revision as if you were doing an example for your students (and all of us here!). This is completely helpful – especially suggestion number 3 which seems like a great first draft tool for moving forward when stage fright threatens. Thanks. So useful – and the wonderful Glaciers making an appearance too. Another interesting author for radical transitions is Muriel Spark, who leaps back and forth in time and space and between great events and small. The Prime of Miss Jean Brodie and The Girls of Slender Means give away what could have been major plot points as casually as anything. But that requires a certain fortitude to carry off , I think. Lorrie Moore can pull off a transition like no other. Treat yourself and pick up Birds of America. I’m always mystified by masters (like Trollope) who can suddenly transport to a whole different scene in the next paragraph, and take the reader with them. Yet there is no visible transition. That list looks useful, but the two quoted sections at the top are barely transitions at all, more continuations of the same scene. I actually like a transition that really shows off (sometimes) or that makes the reader intuit some of what’s happening. Gabriel Garcia Marquez did quite a few of those in One Hundred Years of Solitude, often skipping over years in a line or two to get to the next bit. And I remember Nabokov did it a lot, too. In Bend Sinister, he literally intercedes as a god-like character to free his protagonist from captivity, just because. Douglas Adams and Kurt Vonnegut often used funny bits of history or non sequiturs about a tangential character to transition (falling whale and bowl of petunias, for instance).